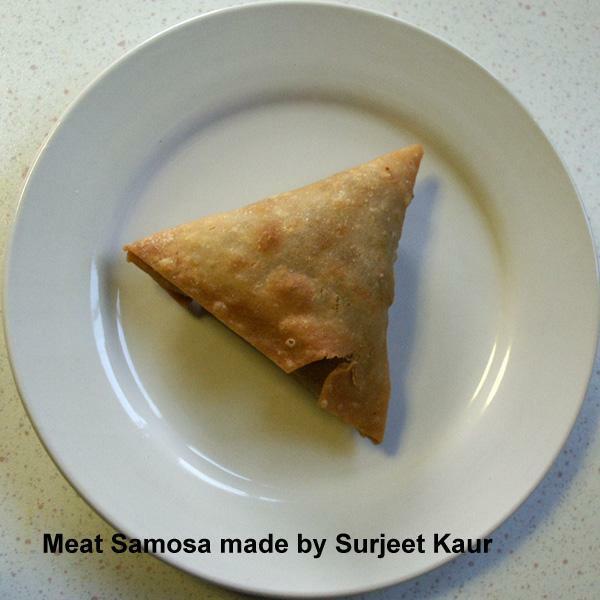 Samosa is one of the most popular Indian savoury snack. Most English supermarkets now stock it and it has become part of British Menu. Although easy, it can rather fiddly to make. If you make them smaller samosas, the number will increase. It is also called as Singhara, after the triangular water chestnuts of India known as Singhara. This quantity will make approximately 16-20 average sized samosas. Place flour, salt and oil in a bowl. Rub with your fingers, like pastry flour. It should look like bread crumbs. Make firm dough adding a little water at a time. I tend to make mine in a food processor, it is easier and quicker. If making by hand, knead it well. Keep aside for 20 minutes, covered with a moist cloth and then knead again. Add onion, ginger and green chillies and fry until onions are golden brown. Add meat and stir fry until meat is nicely browned. Add spices and stir fry for a few more minutes and add peas. Turn heat to medium and cook covered until meat is tender and all water is absorbed. Filling should be quite dry. You can turn the heat up towards the end and make sure all water has dried. Turn heat off and allow to cool completely. Mix 1 tsp. flour with 2 tbs. water, to make a 'glue'. Keep it aside. Divide the dough into 8-10 portions and make balls, using greased hands. Keep covered with a moist muslin/cloth. Lift one half in your palm and make a cone, by folding the straight edge in the centre and overlapping. Glue the overlapping edges (4-5 mm. overlap) and press gently to give a good seal. Now fill the cone with approximately 2 tbs. of the meat mix. You should have enough edge left at the top (4-5 mm), to get a good seal. Using the 'glue', press and seal the edges together. Heat the oil in a wok or karahi on medium heat. Test by putting a small piece of dough into it, it should sizzle and rise to the top quickly, but the oil shouldnt be smoking. Put as many samosa as will spread out easily in your wok and fry gently to golden brown. If you fry too fast, the pastry will not be crisp. Take out and place on kitchen paper, to absorb surplus oil. Serve hot with Green Mango Chutney or Tomato Ketchup. Make small, egg sized balls of dough. Roll out one thin chapatti at a time and cook on one side on a heated griddle for a minute or so. There is no need to cook the other side, but you can, very slightly, if you want to. Make a stack of chapatties before making samosas as follows; cut each chapatti into half and continue as above, step 17. Place all ready samosa on a tray, cover with a cling film and leave in the freezer so that each samosa freezes individually. Now place in a tub/box/other container that has and airtight lid anf freeze. Defrost fully before frying. You can use Filo Pastry or Puff Pastry or Short Crust Pastry too. Samosas made these pastries can be oven cooked, following pastry instructions. 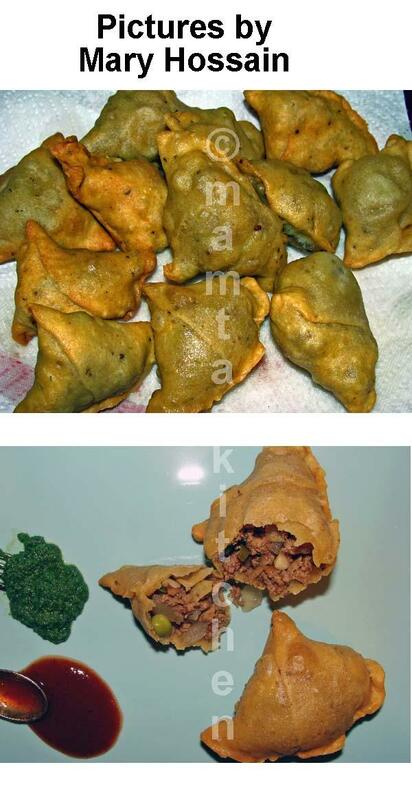 Samosas can also be made with Chinese spring roll pastry. Here is a little trick that I learnt from a lady called Surjeet, who makes superb samosas and sells them in her shop. When making vegetarian and meat samosas on the same day, make a little V notch or cur in the edge of the pastry of one type, see picture. You will never get them mixed during frying or serving.